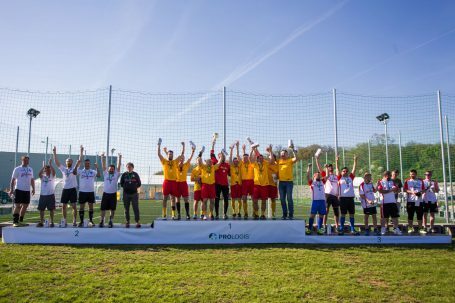 Prologis, Inc., the global leader in logistics real estate, held its inaugural five-a-side football tournament at Prologis Park Bratislava, as nine teams made up of Prologis customers and employees battled it out under clear blue Slovak spring skies for football supremacy. First place honours went to the team from DHL, with teams from Spandex and Schenker coming in second and third, respectively. There were also awards for top scorer and best goalkeeper. The tournament follows in the footsteps of another successful tournament that has been held in Hungary for the last four years. The fourth edition of that competition took place in September 2017 at the recently opened recreation park at Prologis Park Budapest-Gyal, where a record 12 teams participated. In the interest of promoting and nurturing healthy lifestyles, Prologis has built, where possible, “relaxation zones” at selected logistics parks across Central and Eastern Europe (CEE) to encourage employees at the parks and the wider communities in which they are located to enjoy outdoor activities such as sports and picnics. These areas, which comprise 5-a-side football pitches, beach volleyball playgrounds, cross-fit zones and grilling facilities, can be used by all employees and clubs to train and gather. They are also used to host sporting events throughout the year. With its active engagement in four CEE countries and a portfolio totalling 4.3 million square metres, Prologis is the leading provider of distribution facilities in Central and Eastern Europe (as of March 31, 2018).